Prepare asparagus by washing and trimming 1" off ends. 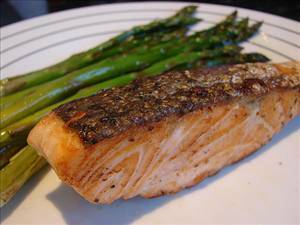 There are 453 calories in 1 serving of Broiled Salmon with Asparagus. Calorie split: 50% fat, 12% carbs, 38% protein.